Each morning at PBS, the entire staff of "NewsHour" gathers in a conference room for the daily morning meeting. The network is structured very much like a newspaper, divided into beats with beat leaders. Everyone from interns to senior executives fill the chairs around the conference table. Producers and staff writers, along with "NewsHour" co-hosts Judy Woodruff and Gwen Ifill, are all present. "NewsHour" Executive Producer Sara Just then opens the table for discussion: Each beat shares its ideas for upcoming segments, but everyone is encouraged to suggest story topics. The meeting has one main priority. Find diverse voices, particularly women. When it comes to featuring a balance of men and women, PBS is undoubtedly leading the pack. When Woodruff and Ifill were named co-hosts in 2013, they became the first female co-anchor team at a network broadcast. According to the latest study by the Women's Media Center, PBS has a woman in the anchor chair 97 percent of the time. "NewsHour" is still the only news program featuring two women anchors. In terms of field reporters and correspondents, 55.9 percent of contributors at the network are male and 44.1 percent are female. But "NewsHour" is the exception. Most networks are not striking this balance -- not even close. In 2014, 62.1 percent of news was produced by a man, the WMC study found. Only 37 percent of print news stories were reported by a woman last year. A woman was in the anchor chair just 17.1 percent of the time at ABC "World News," 15 percent of the time at NBC's "Nightly News" and a mere 9.5 percent of the time at CBS' "Evening News." The Sunday morning news shows featured male guests 74 percent of the time. Of all the networks examined by WMC, women anchored the evening news only 32 percent of the time. "Overall, our findings demonstrate that media on all platforms are failing women," WMC President Julie Burton told The Huffington Post. The underrepresentation of women is a problem that has long existed in media -- in print, television, radio and online. But PBS has managed to find effective solutions by making gender equality a priority. "It's on everybody's mind," said Just, the executive producer. "It is a conscious decision every single day," Woodruff told HuffPost matter-of-factly. "We literally cast our reporters and producers to go out and actively look for people and make a triple effort to make sure they are finding people who are diverse in gender, race and age." Other top leaders at the network are also women: Paula Kerger, president and CEO of PBS; Sharon Percy Rockefeller, president and CEO of WETA, the station that produces "Newshour"; Patricia Harrison, president and CEO of the Corporation for Public Broadcasting; Beth Hoppe, PBS chief programming executive; and Marie Nelson, PBS vice president of news and public affairs. "PBS has done a remarkable job of finding great women, promoting great women and making sure that women are not just on the air but also behind the scenes, making decisions," Woodruff said. For PBS, it all comes down to simply setting a goal and working hard every day to meet that goal. "It’s a matter of being deliberate about it and saying, 'This matters, this is a priority,'" Woodruff said. "If you don’t do that, it’s so easy to slip back into the trap and just say, 'Well, we used so-and-so last time we did this topic, so let's use them again.'" "Frankly, there’s no excuse for that," she said. Co-host Ifill knows firsthand what it's like to work in a media world run by men. The veteran journalist has held positions at a number of other news organizations, most of which she says were heavily male. That's not to say, however, that women weren't behind the scenes, driving the machine. "I spent the bulk of my career at newspapers where no newsrooms were run by women," Ifill told HuffPost. "At The New York Times, it was a long time before a woman even made it onto the masthead. But, as in many organizations, it was often women who were keeping the wheels oiled and running." PBS isn't perfect, Just said. She confessed to looking up at times and seeing a panel of all white men on the set. Sometimes, she conceded, the best, most knowledgable people to talk about a certain topic on air happen to be older white men. "Our number one goal is to do the best journalism possible," she said. "But if we do end up with an all white, male panel, then we make it a priority to make sure that the next panel on the next show is more diverse." The ratings show that viewers are responding. The broadcast numbers for "NewsHour" were up 6.7 percent in May 2015 from May 2014, according to Nielsen overnight ratings from TRAC Media. Online, the program was up 15 percent in page views and 36 percent in users in May 2015 compared to May 2014, according to Google Analytics. The show's video views have soared -- up 115 percent in May 2015 from the month and year before. PBS is also the No. 1 most trusted of all nationally known institutions, and has been for 12 years in a row, according to a national survey. "We truly want to reflect America," Woodruff said. "We don’t think it makes sense to have a news program that looks like an island. This is a diverse country. If we don’t reflect that then we’re not credible." While women may be a minority in journalism, as consumers of news, women are the majority. Women make up 54 percent of the top consumers of media across radio, television, Internet and print, according to Nielsen data. 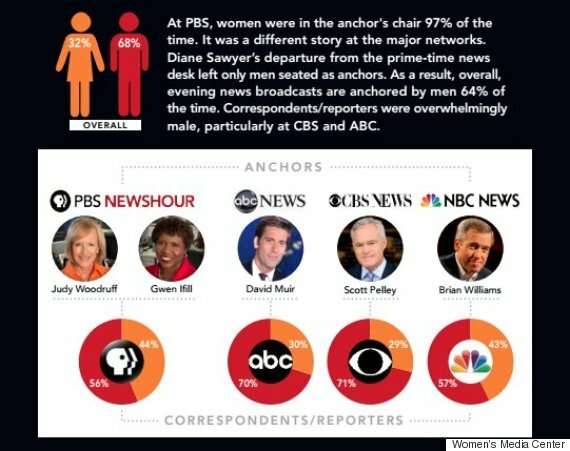 PBS realizes this, and says its just another reason they value women anchors at the network. If media companies are smart, Burton said, they'll respond to this reality and change their tactics as well. But media gender equality won't be achieved without a fight. "In the same way that women were never 'given' the vote ... we know that if we do not advocate for an equal role for women in media, that role will not be freely 'given.'" Burton said "pressure" needs to be placed on every network to transform the system. One initial step that every network can take, she said, is to perform an internal audit to ensure that each news program has an equal number of women in both on-air and off-air positions. She said networks should also take a close look at their hiring and retention rates, and set goals to ensure that people they put on the screen are not always white men. "No news program should ever be able to say they can’t find enough women to put on air," she said. "Media companies should be willing to take stock of their output and ask themselves how they can operate differently -- and be willing to hold other media accountable for gender imbalances." But for Ifill, it's not just about who's sharing the news. It's also about changing lives. "I remember the first time I saw a black woman sitting behind a news anchor’s desk," she said. "This was in the 1960s, her name was Melba Tolliver and I recall she wore an Afro. I was blown away. With more women in front of the camera, we can do that for more little girls."